One of my favorite dishes to eat at Panda Express has always been the Kung Pao Chicken, but sadly their version is not quite Keto-friendly. This recipe is such a close copy-cat that it is deeply satisfying. 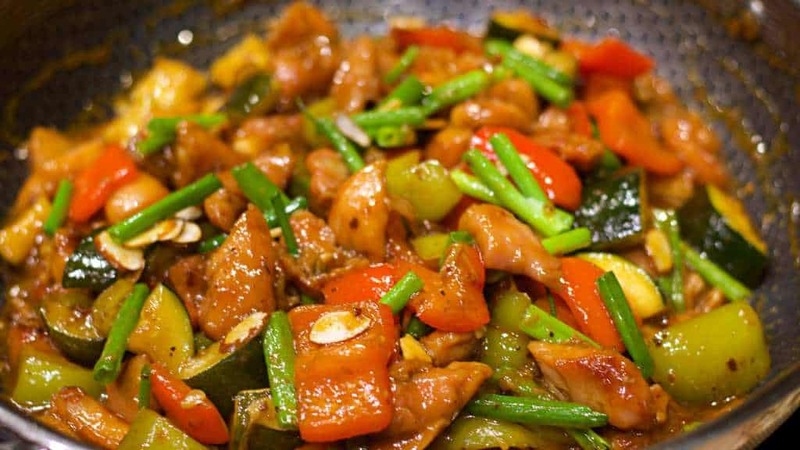 One of my favorite Chinese dishes is now Keto Kung Pao Chicken. From there, rather than serving this dish on a bed of Riced Cauliflower, or some other noodle or rice attempt, I like the way that Panda Express prepares their Kung Pao, with a bulk of sliced Zucchini spears in it as a good filler. The combination of vegetables ends up making this dish a good source of your veggies, but you could also feel free to increase the ratios of chicken to vegetables if you want to fatten the dish up, or even cut down on some of the carbohydrates. I personally like to source the majority of my daily carbs from fresh vegetables, as I believe that keto-friendly vegetables should still remain a regular part of your meals. When shopping for your ingredients please keep in mind that not all brands are created equally, and some have totally different ingredients or additives in them. Be sure to read the labels before you buy them to make sure that things like your Vinegars are not sweetened and things like that. Start by cutting up your Boneless & Skinless Chicken Thighs into chunks that are about 1″ square, or as close to that as you can get them. Place the chicken in a Medium Mixing Bowl. Sprinkle the Chicken meat with Baking Soda and toss by hand to get an even coating. Drizzle the Chicken with about 1 Tablespoon of the Liquid Aminos -or- Coconut Aminos. In a Small Mixing Bowl combine 4 Tablespoons of the Aminos, 1 Tablespoon of the Vinegar, the Garlic Chili Sauce, Monkfruit Sweetener and the Chicken Bone Broth. Whisk to get the sauce evenly mixed and to dissolve the Monkfruit sweetener. In a Large Wok over Medium-High Heat warm up 2 Tablespoons of the Avocado Oil. Add all of the Chicken Thighs, and toss to get the chicken evenly coated with the hot oil. Brown the Chicken for approximately 10 minutes to get the outsides fully seared. Once fully browned remove the Chicken from the wok and set aside to add back in towards the end. Add 2 more Tablespoons of Avocado Oil to the Wok. Add the Garlic, Ginger and Black Pepper and saute for about 1-2 minutes, until fragrant. Add in the Bell Peppers, Zucchini, and Celery and toss in the oil to coat evenly. 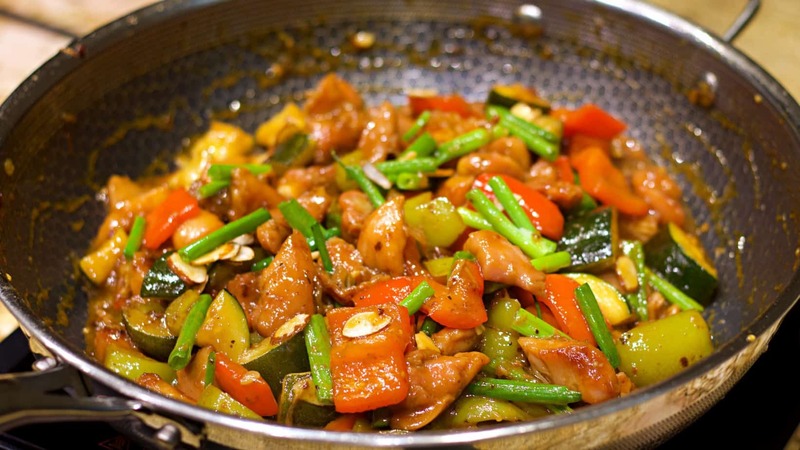 Cook for approximately 5-8 minutes, or until the vegetables start to become soft in texture. Add in all of the Sauce, and simmer for about 5 more minutes. If you would like your sauce thicker you can optionally sprinkle in about half a teaspoon of Xanthan Gum, which will give it a thicker texture (similar to how Corn Starch thickens up sauces). Add the previously browned Chicken Thighs back into the wok and stir constantly while cooking for about 5 more minutes. In the last couple minutes of cooking add the Sliced Green Onions and the Sliced Almonds. You could choose to leave these out, but I feel that they complete the dish. Special Note: You could opt to serve this over something like Riced Cauliflower, but I prefer not to. The flavor of this dish is spot-on by itself, and I personally do not think that the flavor of Riced Cauliflower would add much to the flavor. 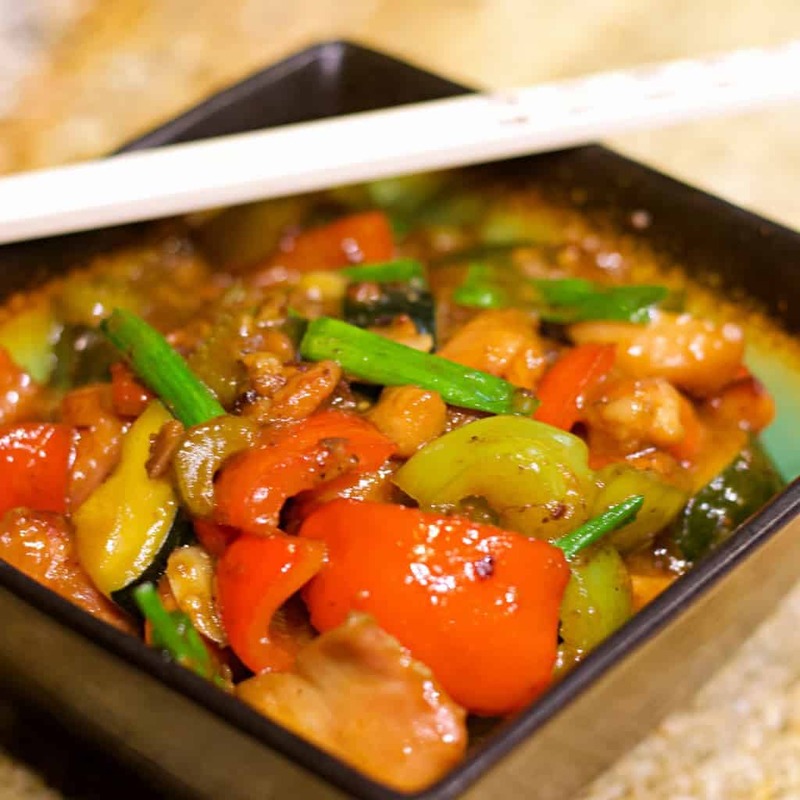 If you choose to do so, you will want to reduce the amount of the Keto Kung Pao Chicken that you serve. Also, if you would a little bit more asian style flavor, towards the end you could also toss in a Tablespoon or two of some Toasted Sesame Oil to enhance the flavor (which would also increase your Fat ratios for your Macros too). This was delicious! I Made it today as my meal prep for lunch in the upcoming week. You won’t need any cauliflower rice with this. 5 stars from someone who actually made it. prepped this in the afternoon and made for dinner. The veggies and spice blends were great. The chicken was gross. I would leave out the marinade, it made the chicken very soft and mushy. Separated the chicken out of the veggies and threw it away. Won’t make this again. How long did you leave the chicken in the Marinade for? You don’t leave it in there for very long, because it is really effective at tenderizing. I just made this today. I agree with Lisa. I didn’t leave the marinade for too long, maybe 7 mins max while preparing other items? But it has a strong after taste that left me feeling a little sick. It was my first time using Bragg’s liquid aminos so maybe that’s the after taste? Can I use Erythritol swetner for this, so looking forward to it also can I use Olive oil?…Thanks. What are aminos and where can they be bought? They are Coconut Aminos. They are usually for sale near the regular soy sauces at places like WalMart, Kroger, Sprouts, etc. This aminos looks to have 100 mg of carbs that seems really high to be a low carb dish couldn’t we sub like a low sodium soy sauce. Or am I not understanding the carbs of the aminos? This came out sooooooo good! Thanks for the recipe!! You’re welcome Sue! Sometimes I miss good Chinese Restaurant Food so I have to come up with stuff like this to make it happen. I am always looking for good healthy recipes, this will be on our table tonight for dinner. Went out and bought a carbon steel wok yesterday , something that I have needed for a while now , can’t wait to try this. I will let you know how my family likes it. This dish was fantastic! Absolutely going in our regular meal rotation! The non-Keto family members had theirs on rice and loved it! I just ate a bowl of the chicken and veggies on their own- so satisfying! Thank you for a great recipe! I’m the only member of my home on Keto. I made this last night and it’s fantastic! The taste is perfect. I don’t feel like I’m missing out on anything. It was perfect by itself. I have so much leftover, I’ll have lunch for work for days! Thanks for creating & sharing! Your recipe does not print properly. It prints out the links to purchase all of the products and that makes it impossible to read the recipe. Please fix this. Thanks. Do you have to use a wok? I dont have one. It helps to toss the food around without it flying out since it has high sides. But if you are careful you can make in in a frying pan too. Can you clarify the nutrition info for the recipe? 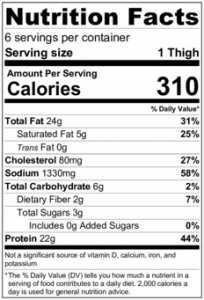 What’s shown is the nutrition info for one chicken thigh – not for one serving of the dish with all of the ingredients in the recipe. Thanks! Still looking for a response to my question – can someone from Keto Daily please respond? Thanks! Hi Karen, the amounts shown are for one serving, including the thigh and the equivalent share of other ingredients split proportionately. Thanks so much for responding! I’ve made this several times now and we love it!! I swap out the zucchini for broccoli which really grabs that yummy sauce. I also add a couple of finely diced jalapeños to the garlic and ginger to give it more spice. And I double the amount of sauce because, well…the sauce is amazing! Thank you for a great recipe! Omg! Followed the recipe exactly (which I never do add a little of this or that) and it came out amazing!